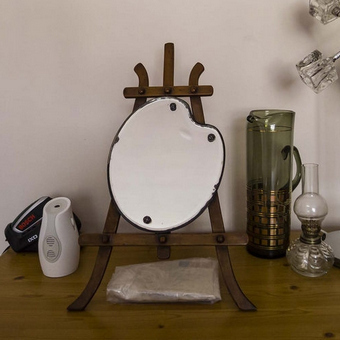 The treasured object chosen by Janis was a palette-shaped mirror on an easel, originally belonging to her grandmother. 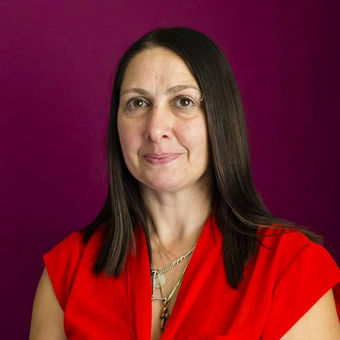 As a practitioner in holistic therapies, Janis has an interest in the effects that colour and art can have on the body, mind and spirit. 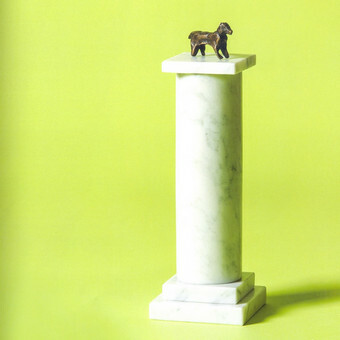 The dog on the column is a model of Janis's beloved Bruce, an English Bull Terrier, which she made in clay during one of the project's sculpture workshops at Liverpool Hope University. It was her first hands-on encounter with sculpture and it was significant that she chose to portray her dog. The clay model was cast in bronze and placed on a pedestal of Italian Carrara marble. The use of classical materials and form alludes to public statues where the larger-than-life victor or hero, often caught in freeze-frame action, is placed on a tall pedestal, elevating them above the mortals at ground level. The artwork references the hero/warrior characteristics of the English Bull Terrier breed.